SCOTS will lose European Union membership if the country wins independence, according to EU policy bosses. Nationalists believe an independent Scotland would have no problem remaining in the European Union. But European Commission head of growth and jobs Olivier Bailly said on Tuesday the move would take the EU into uncharted waters. Mr Bailly confirmed an independent Scotland would be left outside the union, at least temporarily. He said: “Any secession process for member states will have to be organised according to international law so that this new organisation gets recognition from the international community. “Then if want to apply for EU membership this will have to be done by treaty regarding provision for accession – there are two different steps. Mr Bailly’s statement comes after European Commission President Jose Manuel Barroso said any country winning independence from a current EU member state would have to renegotiate its membership. Mr Bailly attempted to play down his comments the following day and issued a statement that he was answering a “speculative question”. But President Barroso re-confirmed his own position later the same day, repeating the need for a negotiatiated – not automatic – membership. Unionist politicians jumped on the statement, which they said meant an independent Scotland risked losing EU membership. Labour MEP and party spokesman on constitutional affairs David Martin said it meant EU membership was not automatic. Scots MEP George Lyon, a Liberal Democrat, said the answer confirmed Scottish membership would be subject to a vote. He said: “Contrary to what Alex Salmond claims, it is not within his gift that Scotland would become a member of the EU. But the Scottish Government have said there is nothing in Mr Barroso’s response that suggests Scotland will not retain its place in the EU. SNP MEP Alyn Smith said unionist parties were scare-mongering. He said: “The president has made it clear he is not going to get involved in these discussions because this is a matter for the people of Scotland. “It is utterly inconceivable this could be any other way. 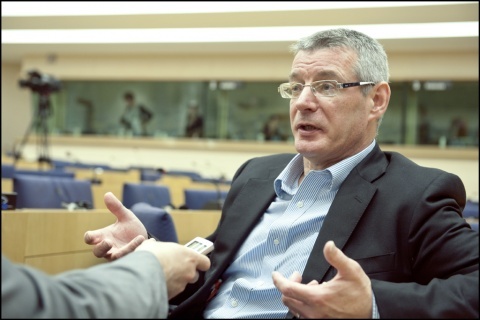 And SNP MEP Ian Hudghton said the president’s statement was being twisted for political gain. A spokeswoman for First Minister Alex Salmond said independence would make no difference to Scotland’s membership of the EU. She said: “As many experts have confirmed, Scotland is part of the territory of the European Union and the people of Scotland are citizens of the EU. “There is no provision for either of these circumstances to change upon independence, and the rest of the UK will be exactly the same position.